NEW SMYRNA BEACH, Fla. (February 15, 2018) – Cole Anderson and the No. 97 TimberwolfProducts.com Toyota team found Victory Lane at New Smyrna Speedway once again on Thursday evening. 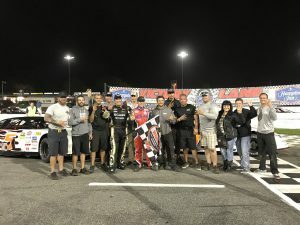 Recording his fourth-straight Pro Late Model victory, Anderson continues to lead the points in the annual World Series of Asphalt Stock Car Racing. Anderson’s teammate, NASCAR Camping World Truck Series champion, Mike Skinner finished second. Anderson started the 35-lap feature in the fourth position. Wasting no time, the 20-year-old Minnesota native overtook the leader by the fourth lap. With a clean race to the finish, Anderson continued to pace the field all the way to the checkered flag. Anderson will return to the wheel of the No. 97 TimberwolfProducts.com Toyota for the Pro Late Model division’s 100-lap feature on Friday evening. For more information about Cole Anderson, visit ColeAndersonRacing.com.